We aim to bring respect, discipline, and fitness to our classes. We want our children to learn key life skills early on that will shape who they grow up to be. Classes consist of fitness, martials arts, and "mat chats' to educate and grow our children. A great program for the youth of Colorado! Provide great fitness and martial arts discipline to your child's life. RAD Muay Thai is a great addition that will teach kids to set goals and work hard to achieve them. Through our belt system we help children work toward higher achievements. They will learn to "put in the work" to earn ranks and they will mentor the younger children and learn to be accountable for themselves and others. 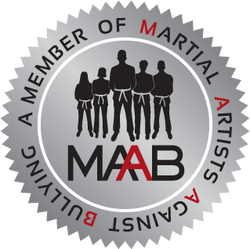 We are very proud to be a member of "Martial Artists Against Bullying". We conduct anti-bullying seminars and fully promote a bully-free zone. We implement anti-bullying curriculum in our youth programs in an effort to prevent bullying on both sides. Martial arts aims to humble us and teach us confidence and self-discipline. These are the pillars that will build our youth into the people they will become. - 28% of students aged 12 - 18 are bullied each year. - Most students don't report bullying when it happens. - 1 in 10 students drop out of school due to bullying. - No other industry is in a better place to fight bullying than martial arts.